One thing I noticed is some blogs have complained about the amount of product. 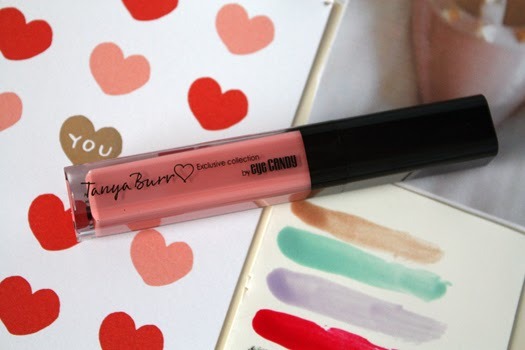 The Tanya Burr glosses have 8ml of product in them which is more than a Bobbi Brown or Mac lipgloss. They're also friendlier on the wallets. The packaging is gorgeous-very luxe and reminiscent of higher end lipglosses. Afternoon Tea is quite a peachy pink. It has a cream finish and there's no shimmer throughout so the colour is more opaque. It is super easy to apply, the applicator hugs your lips. It is also deliciously scented-like strawberry milkshakes. Now what I love most about this gloss is it is not sticky. There's nothing worse than a gloss which leaves you pulling flyaway hairs from your lips. It also has surprisingly brilliant lasting power. Once the glossy finish has worn off you are still left with the colour on your lips so touchups become optional. Tanya Burr may have just turned me into a lipgloss convert and from what my giveaway winner tells me, Aurora is just as fabulous. *Have you tried any of the Tanya Burr lip and nail products? Which were your favourites?